Those questioning when improvements will be made in regard to the Lee County Shoreline Protection Project will have to wait a bit longer before any progress is being made. Gasparilla Island State Park (GISP) Manager Rick Argo said the current project constructed in 2013 (similar to the 2007 Gasparilla Island Shore Protection Project, which placed sand from the county south and continued into the park) was to provide sand and renourishment to the beaches on the southern part of the island. 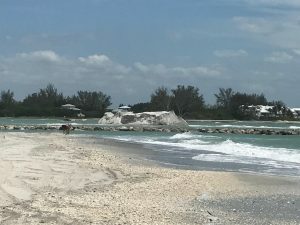 Lee County Government Communications Director Betsy Clayton said the County is working with the U.S. Army Corps of Engineers (USACE) on the next beach renourishment project for Gasparilla Island. In recent years, a number of named storms passing within a 50-mile radius have significantly impacted the project area, including Irma (2017) Bonnie (2010), Charley (2004) and Gabrielle (2001). Damage from these storms, as well as damage from more distant storms causing indirect impacts, included substantial erosion from winds, waves and elevated water levels. In 2013, a rehabilitation effort for Gasparilla Island was approved in order to maximize cost efficiency by combining dredge mobilization costs and to restore the protective capability and benefits of the project. Federal participation expired in December 2016, ten calendar years after initial construction in 2006. Lee County is the non-Federal sponsor of the project. A 2016 Army Corps of Engineers environmental assessment report shows the length of the last shoreline protection project covered 2.8 miles of beach area. Erosion, both long-term and storm-induced, is the greatest problem in the area. The loss of protective beach and dunes due to shoreline erosion threatens infrastructure. Erosion also threatens natural habitat and recreational opportunities. The study area has experienced long-term erosion. Some natural recovery occurs in the short term, but the long-term trend is erosional. Homeowners seeking to protect their property have erected some erosion control structures, such as seawalls. These structures limit or eliminate the natural interaction, in which dunes feed sand to the eroded beach during storm events. Limiting this natural protective function makes infrastructure and the environment adjacent to protected properties more susceptible to storm damage. Without a federal project, it is likely that the sponsor and private homeowners would take steps to combat erosion and loss of property, running the risk that these efforts might not be coordinated in a holistic fashion, incorporating regional concerns such as sediment movement and environmental/habitat considerations.